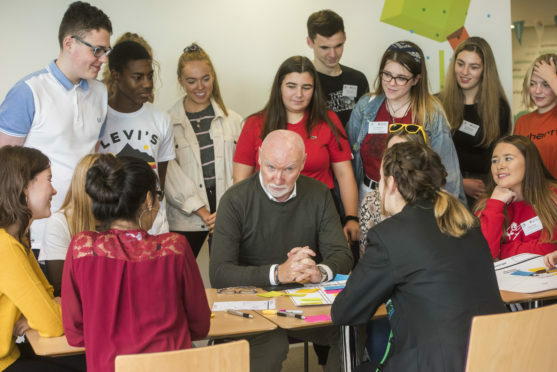 Schoolchildren from across Dundee have been given a shot of inspiration by Scots billionaire Sir Tom Hunter as part of an event to find new ways of tackling issues affecting young people. Around 120 youngsters attended Abertay University’s Innovation Lab as part of a design initiative to tackle bullying, stress and mental health issues. It is hoped new methods developed during the session as part of the national Year of the Young People 2018 could go on to directly influence Dundee City Council policies. Sir Tom, who delivered a welcome to the participants before a day of design, brainstorming, workshops and presentations, hailed the importance of involving youngsters in shaping decisions. He said: “Putting policy into the hands of those the policies will impact upon makes absolute sense. Groups of youngsters in attendance were made up of S4 to S6 pupils from all Dundee schools, as well as others aged up to 26 years old from organisations such as Lift Off, Family Nurse Partnership, Dundee Carers Centre and Dundee Youth Council. They also heard a closing address by Gavin Oattes, award-winning entrepreneur and motivational speaker for workshop provider Tree of Knowledge. Ideas from the day will be collated and presented back to city councillors, with the aim of informing future policy, affecting change and creating a legacy of service improvement for future generations. Dundee City Council children and families service convener Stewart Hunter said it had been a “fantastic experience for everyone who took part” and a “fitting way of celebrating the Year of Young People”. In addition to the workshops, the young people also took part in taster sessions across a selection of Abertay’s academic departments. Those on offer included Games and Arts, Cybersecurity, Marketing, Business Management, Accounting and Finance, Law, Food Innovation, Forensics, Science, Civil Engineering, Sociology, Psychology and Mental Health. Abertay University principal Professor Nigel Seaton said: “Bringing young people into the decision making process for new policy on these important issues is a fantastic idea. “I have no doubt that Innovation Lab will bring a fresh perspective to the table. 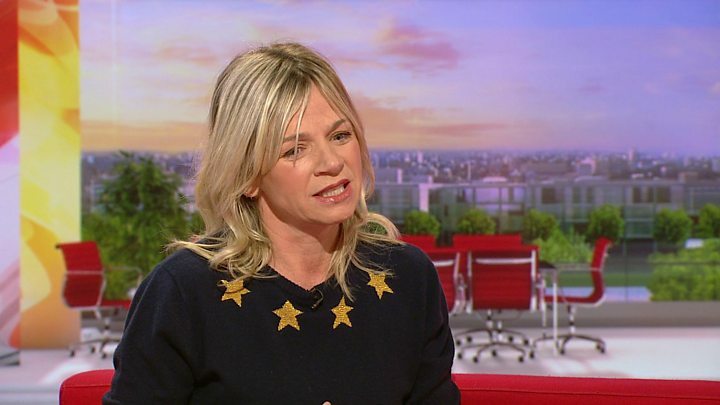 Zoe Ball has said the death of her boyfriend last year left her with “lots of questions,” as she prepares for a cycle challenge to raise mental health awareness. Cameraman Billy Yates, found dead at his home last May, had been living with mental health issues for years. Ball will also film a documentary about mental health while taking part in the Sport Relief challenge. “I wanted to do something for him,” said Ball. The Strictly Come Dancing: It Takes Two host has been out training ahead of her challenge. Details of the route, including the distance and locations, are yet to be revealed, but she admitted it was “a long way” for a novice cyclist. “I think lots of people know that I lost my boyfriend last year, who lived with depression for a very, very long time. “I was really touched and moved by the amount of people who got in touch with me, who have been through the same, or living with the same issues. Speaking about Yates’ death, she added: “I was left with lots of questions. While we’re doing the challenge, we’re making a documentary. I’m going to visit projects helping people living with mental illnesses – that can be anything from self-harm, anxiety, depression, bereavement, bullying – all of those issues. “I have lots of questions about what are we doing? How can we help? How do people find the right help? She said the challenge was about “spreading some awareness and hopefully helping people find the right help and some hope”. In her interview with Evans, she told him: “I wanted to raise some awareness. I wanted to do something for him – I wanted to do something for everyone else. She has already got tips from Davina McCall, who completed her own Sport Relief challenge in 2014. McCall has given some “top tips” on “looking after undercarriages”, said Ball. Unveiling news of her mission on BBC Breakfast, she said: “I’ve ridden shopping bikes. My dad held my saddle and pushed me along when I was five. I’ve had a go on a BMX. “But road bikes is a whole new thing. Cleats? Oh my goodness me. Sport Relief is held every two years. The 2016 event saw comedian Eddie Izzard run 27 marathons in 27 days and Radio 1’s Greg James complete five triathlons in five days. Sport Relief is taking place from 17 to 23 March. A Dundee teenager who has suffered from severe depression and suicidal thoughts is hoping to track down an inspirational taxi driver who she says turned her life around. Chloe Wagener, 17, wants to thank the mystery driver who took her home Tuesday morning, having picked her up outside the Corfu Kebabs takeaway in North Lindsay Street at 1.45am. The life skills student, from Fintry, said she has been dealing with a number of mental health problems in recent years, including depression and anxiety. These have been brought on by a number of events in her life such as family bereavements and illnesses, and having been a victim of bullying. It was an outpouring of all of this to the selfless cabbie, she says, that caused her to have a change of heart. She said: “We began talking and I just started to tell him about all the things that have been happening in my life. “He started speaking back to me and said: ‘Do you know something? I’ve been through the same’. Chloe said she had made multiple attempts on her own life and had resorted to self-harm. She thinks she has attended the mental health unit at Carseview as many as 10 times in recent years. However, she said that the taxi driver’s advice had given her a new perspective. “It made me realise that if I was to end my life I would be missed a lot. Chloe said the driver, who never gave his name, was in his late forties, of Pakistani descent, and had short black hair. He wore black glasses, was clean shaven and had a small mole on his face. She believes that, in all, the driver spoke with her for about an hour — but was in no rush to send her on her way. She added: “I’m struggling with a lot every day and I’ve been bullied to the point I lock myself in bathrooms or sit crying in the shower. But him talking to me has put a smile on my face and changed how I’m looking at life. The cabbie’s actions were praised by Wendy Callander, executive director at Dundee Association for Mental Health. If you know who Chloe’s Good Samaritan is, contact the Tele directly on 575350.